Pack of 12 contains x6 clip & x6 top hangers. Pack of 30 contains x12 clip & x18 top hangers. 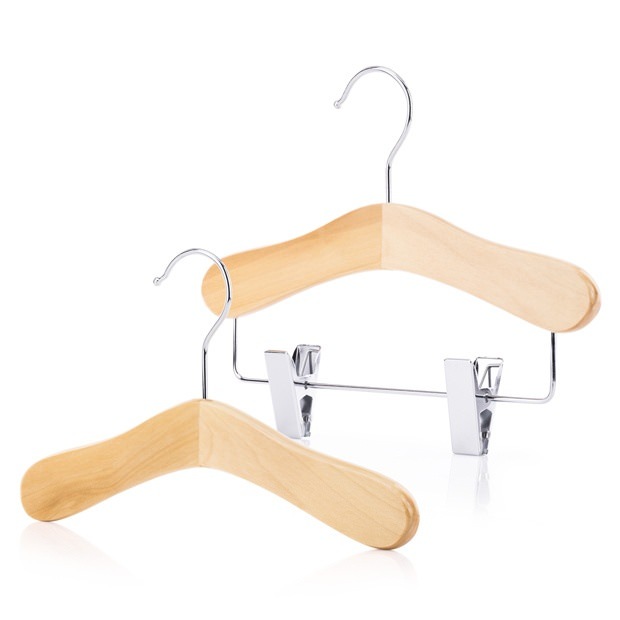 Premium quality hangers with a natural varnished finish. Solid, one piece wood construction, no central join, strong & durable. Clip hangers have a chrome bar with 2 protective soft grip, non-slip clips. Completed with 360° chrome swivel hooks. Size: Width 25cm (9.8'') approx. Love the look and quality of these hangers. Have bought before and would definitely recommend anyone to buy. Delivery quick and hassle free too. Ideal for baby and toddler garments with their smooth finish.